Gospel music may refer either to the religious music that first came out of African-American churches in the 1930's or, more loosely, to both black gospel music and to the religious music composed and sung by white southern Christian artists. While the separation between the two styles was never absolute — both drew from the Methodist hymnal and artists in one tradition sometimes sang songs belonging to the other — the sharp division between black and white America, particularly black and white churches, kept the two apart. While those divisions have lessened slightly in the past fifty years, the two traditions are still distinct. 1. Clarence Smith - Sometimes I Feel Like A Motherless Child 2. Irma Thomas - In Between Tears 3. Dorothy Morrison - I Can’t Go Without You 4. Bobby Bland - Let’s Go Together 5. Voices of East Harlem - New York Lightning 6. Marion Gaines Singers - Grandma’s Hands 7. Sweet Inspirations - Every Day will Be Like A Holiday 8. Jessy Dixon - Love Lifted Me 9. Aretha Franklin - Lee Cross 10. Odetta - Pastures Of Plenty 11. Kim Weston - Eleanor Rigby 12. Sons of Truth - I Don’t Know Where We’re Headed 13. Jo Armstead - There’s Not Too Many More 14. Esther Marrow - Mama 15. Staple Singers - Tripping On Your Love 16. Gospel Artistics - Lord Is It I 17. Marion Williams - I Shall Be Released album Gospel Soul tells the story of the link between two of America’s most important Black music styles: Gospel and Soul. Both Soul music and Gospel music grew out of Black American migration into urban cities. Whilst the sacred Gospel music took it’s influences from the spirituals and work-songs of working in the field, Soul music matched the fervour of Gospel music with the rhythm and passion of Rhythm and Blues. But for many Soul artists the link between Gospel and Soul is more profound and many artists have managed careers both inside and outside the Church. The shared spirituality of these two styles has also led to some of the most profound and uplifting music. 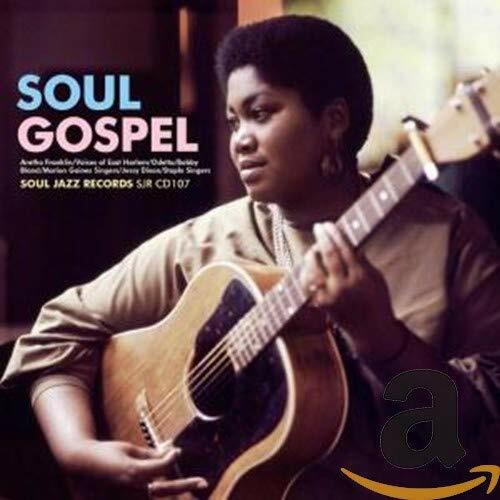 This album features many of the most famous Gospel/Soul crossover artists such as Aretha Franklin, The Staple Singers, Odetta and The Voices of East Harlem alongside lesser-known artists such as Clarence Smith, Gospel Artistics and many more. From Aretha Franklin’s father, the Reverand C.L. Franklin, being one of the most famous ministers in America and friend of Martin Luther King, to The Sweet Inspirations being the in-house vocalists to literally hundreds of Soul artists for Atlantic Records (as well as including group-member Cissy Houston, mother of Whitney Houston), this album shows how two of America’s most important musical forms are inexstricably linked.